Emin’s outrageous reputation and fiery public persona means she needs no introduction. Fourteen years after the Sensation exhibition her largest retrospective is taking place. With pre-booked tickets and a buzz of public excitement surrounding the event it is obvious whether you love her or you hate her Love is What You Want is an exhibition not to be missed. 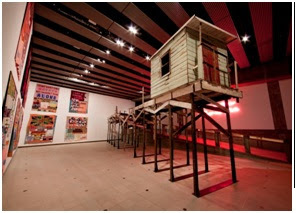 Knowing My Enemy took centre stage in room one of Emin’s solo exhibition at London's Hayward Gallery, a partially collapsed pier made of recycled wood that still held the smell of its life before art. Accompanying this work in room one were the blankets that are only too recognisable as Emin’s creations. Hung one above the other on the wall I found myself negotiating my way under the rickety pier to read the highest placed works which added to the impact of them, as they, like the issues they addressed, seemed so much bigger than myself. Visible individual stitches and floral fabrics combined with the hand written patches make the juxtaposition of the construction and the message so significantly more prominent than I have ever felt it to be from viewing the work photographed. 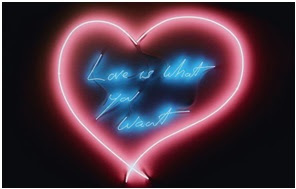 The feeling of being overwhelmed by Emin’s work continued as I viewed her neon creations; displayed in a darkened corridor they initially create the feeling of a seedy alley in Soho. If you’ve never experienced Emin’s work before the self-centeredness of it will have become obvious by this point, further reinforced by the films in the rooms that followed. People stood uncomfortably in the darkened room watching one of Emin’s earliest films, Why I Never Became a Dancer. Her voiceover was frank, with a bitter tone which contrasted with the glitzy clips of Margate seafront and a glittering ocean. ‘Shane, Eddie, Tony, Doug, Richard… this one's for you’ Emin says as a clip of her dancing, spinning and shimmying to You Make Me Feel by Sylvester begins to roll, sticking a metaphorical middle finger up at the boys who had jeered and shouted ‘SLAG!’ at her in the British Disco Dance Championship in 1978. It was after this film that the sense of how brave Emin is as an individual echoed through me. Emotional suicide; the reason for the charred texts and paintings in glass cabinets, and with it the first reference to the alliance with Sarah Lucas. The melodrama of this exhibition seemed to flat line but it was not detrimental; the ‘fun’ artwork had been seen and now tiny self portraits of her in the most stricken times in her life evoke compassion. Stale tampons may push people to question her artistic merit but this retrospective shows Emin to be notably un-phased by these views including works such as I've Got It All; a photograph depicting her pulling money to her crotch, a blatant and shameless statement to all critics. She is quite right to celebrate; Emin is one of, if not the most successful British female artist ever and so if you can forgive the narcissism Love is What You Want is a brilliant chance to view some of Emin’s greatest works.